If you’re interested in learning more about Malcolm X and why he is such a culturally significant figure, then you’ve come to the right place. In this guide, we’re going to delve into the history of Malcolm X as well as learn more about his “legacy” so let’s get straight to it. First of all, Malcolm X was a famous African-American who rose to significance due to his notorious human rights activism in the 1960s. Although some people still believe he as born in Oakland or even Orange County, he was actually born in Omaha, Nebraska. As a young man, he grew up as an orphan due to the early death of his father and the institutionalization of his mother, which led him to be raised in a number of different foster homes. In his early twenties, he was arrested for the crimes of breaking and entering, and during his incarceration, he joined the Nation of Islam. Upon his release from prison, he quickly rose to prominence within the organization and became the public face of the movement, for all intents and purposes. This controversial movement promoted what is now often regarded as black supremacy, and it also campaigned for segregation, rather than joining with the growing civil rights movement which had a strong focus on integration. 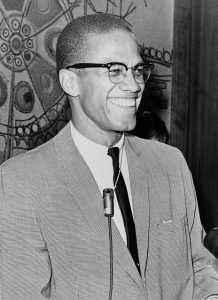 However, by the mid-1960s, Malcolm X grew apart from the Nation of Islam ideology and even expressed regret on several occasions. Instead, he became a Sunni Muslim, and largely disavowed his previous association with the organizations of his past. After his reformation in this manner, he campaigned for black self-determination and also became a significant figure in the growing Pan-Africanism movement that was growing rapidly during the 1960s. The life story of Malcolm X ends with his assassination in 1965 when he was aged 39. The culprits behind the murder were people who were associated with the Nation of Islam, the same group he was connected with in his younger years. Since his death, Malcolm X has remained a key cultural figure, although this is certainly not without controversy. While his early beliefs are still steeped in controversy, he is widely celebrated for his reformation and eagerness to work with the leaders of the civil rights movement in the 1960s. These days, he is largely credited for his inspiration for black Americans and raising their sense of self-esteem, as well as greatly encouraging them to connect with their African roots while campaigning for equal rights within their American societies.